Ever since Sean Gandini and Kati Ylä-Hokkala began Gandini Juggling in 1991 their fertile imaginations have sought to present their art in innovative ways, expanding the traditional form of juggling into the spaces offered by theatrical and choreographic structures. Ylä-Hokkala had a background in rhythmic gymnastics and both she and Gandini performed with Ra-Ra Zoo, one of the UK’s New Circus groups of the 1980s that pioneered a theatrical approach to circus arts. Among circus artists at that time there was a surge of interest in the crossover between dance and juggling but Gandini and Ylä-Hokkala went a stage further. For the first decade of their company they worked with dancer Gill Clarke to explore ways in which a movement vocabulary of the body could inform their performance which meant not only taking class with Clarke but working with her on a choreographic approach to organizing their material. Several works were created in this way and dance became an integral part of Gandini Juggling’s performances. One can’t help feeling the legacy of Clarke, who died in 2011, in the trio of projects Gandini Juggling has instigated over the last three years with three different forms of dance: classical ballet in 4×4 Ephemeral Architectures with choreographer Ludovic Ondiviela; bharatanatyam in Sigma with dancer/choreographer Seeta Patel and contemporary in Spring with choreographer Alexander Whitley that artsdepot has supported and recently presented as part of CircusFest 2018. In each of these projects the performance is not simply a juxtaposition of juggling and dance but the outcome of a process of mutual questioning in which each art form explores ways to integrate its essential qualities into the other’s mode of expression. It’s a complex relationship that requires willingness on both sides for immersion in, and exchange with the alternative discipline and even then the end product is not a guaranteed fusion. In 4×4 Ephemeral Architectures Ondiviela was unable to imbue classical ballet with the ludic virtuosity of juggling, causing a qualitative rift between the two. In Sigma Patel had no problem with matching the gestural dexterity and rhythmic vigour of bharatanatyam but the two forms belong to such different heritages that the seams had difficulty being drawn together. In Spring, however, Whitley and Gandini Juggling have achieved a fusion that in every aspect releases and capitalizes on the potential for such collaboration. The three dancers from Whitley’s company (Yu-Hsien Wu, Tia Hockey and Leon Poulton) and the five performers from Gandini Juggling (jugglers Dominik Harant, Kati Ylä-Hokkala, Kim Huynh, Liza van Brakel, Tristan Curty and dancer Erin O’Toole) create a seamless display that is neither juggling nor dance but somewhere elevated in between. 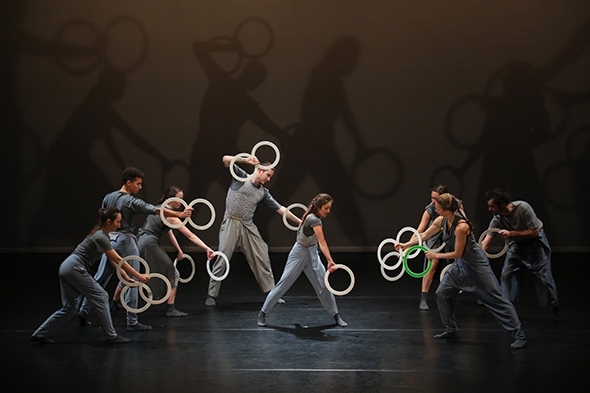 The jugglers merge into the fluidity of the dance while maintaining a strict attention to their skills and the dancers riff on their body phrases as if they are juggling their bodies in space. When they work together they are often indistinguishable, as in the floor routines of complex leg patterns that have the intricacy of knitting, and playful juggling routines in which the dancers participate. From the very opening when Curty sets the tone by informing us dryly that this is the beginning, a sense of humour pervades the performance that is closer to a sense of growing wonder; both juggling and dance are imbued with a never-ending flow of invention and skill like two minds so deep in dialogue that ideas bounce continually from one to the other. With its percussive rhythms, playful dissonances and vivid sound effects that drive the dance as much as the juggling, Gabriel Prokofiev’s score is central to the work. Words are tossed in multiple languages, counts are whispered and colours chanted, merging in an out of the music to form a soundscape that is part circus, part club and part effervescent happening. Guy Hoare’s lighting is a celebration of colour that plays with the score as much as with the bodies that Lydia Cawson has costumed in neutral grey. He lights the performers against initially bright primary shades of red, blue and yellow then moves to black and white with coloured shadows. High sidelights pick out the trajectory and colour of the balls and rings as they reach the top of their arc and Hoare has fun adjusting perspective while intermingling and multiplying projected shadows and silhouettes against brightly-coloured washes. Spring is indeed an appropriate title: the show is an exuberant, irrepressible manifestation of colour and rhythm for which the creators have joined forces in a coordinated gasp of elemental wonder. For detailed information about the history and art of Gandini Juggling, see Thomas JM Wilson’s Juggling Trajectories: Gandini Juggling 1991-2015 to which I am indebted for the background to this review.